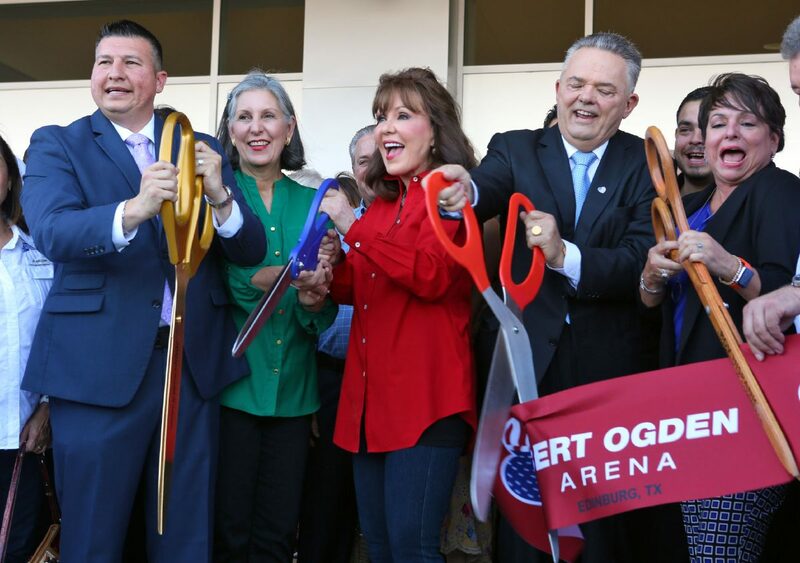 Janet Vackar, center, along with Robert Vackar, right from center, Yolanda Cantu, far right, and Edinburg Mayor Richard Molina, far left, cut the ribbon to open Bert Ogden Arena on Monday, Aug. 27, 2018, in Edinburg. Assisting Janet Vackar, center left, is her sister Kathy Powell. EDINBURG — Developer Alonzo Cantu sat in the front row during the program Monday before the ribbon cutting here for Bert Ogden Arena, a venue he mostly funded and built with his construction company. “The Bert Ogden Arena is going to be the catalyst to make the Rio Grande Valley the next great American destination,” said Robert Vackar, president of Bert Ogden Auto Group. The celebration punctuated the $88 million, 9,000-seat venue, which attracted area dignitaries and city leaders including Edinburg Mayor Richard Molina, Vackar and his wife Janet Vackar — whose father is the arena namesake, Bert Ogden. Ogden started his first auto lot in Edinburg. Cantu has said that he purchased his first vehicle from Ogden. Alonzo Cantu at Bert Ogden Arena on Monday, Aug. 27, 2018, in Edinburg. As speakers take the mic, encouraging Cantu to say a few words, he rejects repeated attempts. Cantu attributes his reluctance to take center stage as a need for highlighting the project rather than himself. And still, after the ceremony, a seemingly endless line of individuals representing organizations, chambers of commerce, and municipalities jockey for position to take photos with Cantu. Cantu sits in a suite overlooking the largest arena in the Valley. When asked about his perspective of the view he built, he talks about work still to be done — how he was at the arena at 3:30 a.m. that morning working on his “punch-list items” to finish before it officially opens Friday with singer Luis Miguel. And at the suggestion the venue is “flashy,” Cantu pushes back. Why has the state and federal government looked over the Valley for infrastructure or highway funding in the past, he posited, or why couldn’t the big Texas universities invest in the Valley, a region populated by over a million people? But Cantu talks like someone who couldn’t wait for someone else to improve things. Through his ventures, he paints a picture of a Valley improved through partners collaborating on shared goals. “The haters — the naysayers — don’t understand what the vision is,” he said. Regardless of one’s opinion of Cantu, it’s undeniable that he’s influencing the region. 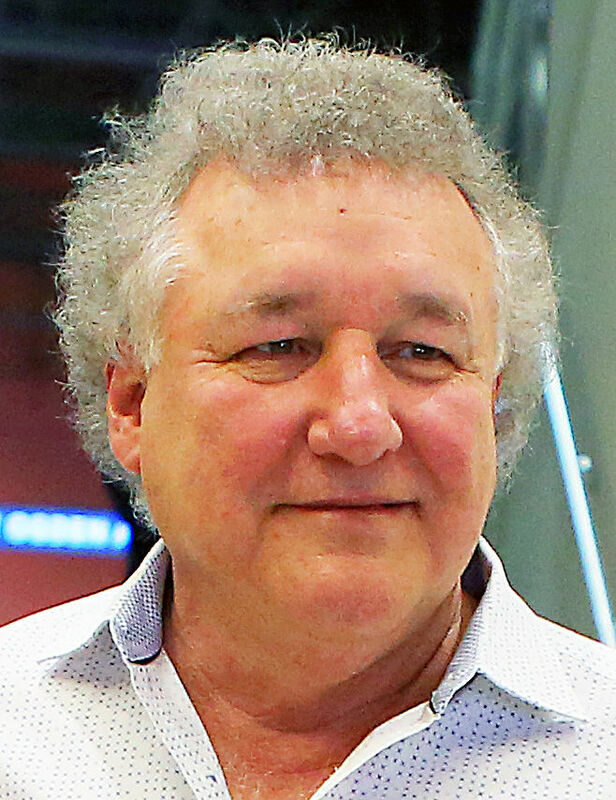 Board member of the University of Texas Rio Grande Valley Foundation, CEO of Cantu Entertainment Group, Lone Star National Bank chairman of the board of directors, Doctors Hospital at Renaissance co-founder and chairman of the hospital’s finance committee — Cantu has a diverse set of objectives. If you ask him, they’re all connected to enhancing the Valley and helping keep talent and resources here. “For decades, we’d had people leave here — brain drain — because there are no jobs,” he said. “In order to create jobs, you have to have quality of life, health care and good schools. He said one of the appeals of the UTRGV School of Medicine was Valley kids having the opportunity to become doctors locally. He sees these students with cultural familiarity as assets. “You know the people and the culture, so it’s a lot easier to get people,” he said. When conceptualizing the UTRGV SOM with then-University of Texas System Chancellor Dr. Francisco G. Cigarroa, UT System recognized a potential limitation was the Valley’s dog-eat-dog, “Friday Night Lights mentality” — where cities vie against one another. “We worked together and that’s what we got,” Cantu said of the universities merging and medical school. “There are a few people in the Valley that have done a good job of working together to think regionally. And Cantu says he practices what he preaches when supporting political figures, as he’s not married to a particular side. “I support anybody who supports South Texas, regardless of the political affiliation. With Border Health PAC, we give money to people who come down here, look at what we have and help,” he said, claiming to have changed politicians’ perceptions of the Valley. “It doesn’t matter if you’re Democrat, Republican, independent … and we don’t give any money unless they visit.